Nagler SM. Tinnitus: A Patient's Perspective. Otolaryngologic Clinics of North America. 2003 Apr. It began as a persistent hiss in both ears and rapidly became a constant unrelenting overwhelming sound like a cross between a screaming teakettle and a thunderous jet turbine. I would walk from room to room trying to "get quiet" to no avail. I would cover my ears not knowing what else to do, only to discover that covering my ears invariably made the sound louder. No way out. Fear. Frustration. Agony. Overwhelming despair. Picture, if you will, the tortured face of the androgynous creature in Edvard Munch 's 1893 masterpiece, The Scream, currently hanging in the Munch Museum in Oslo. 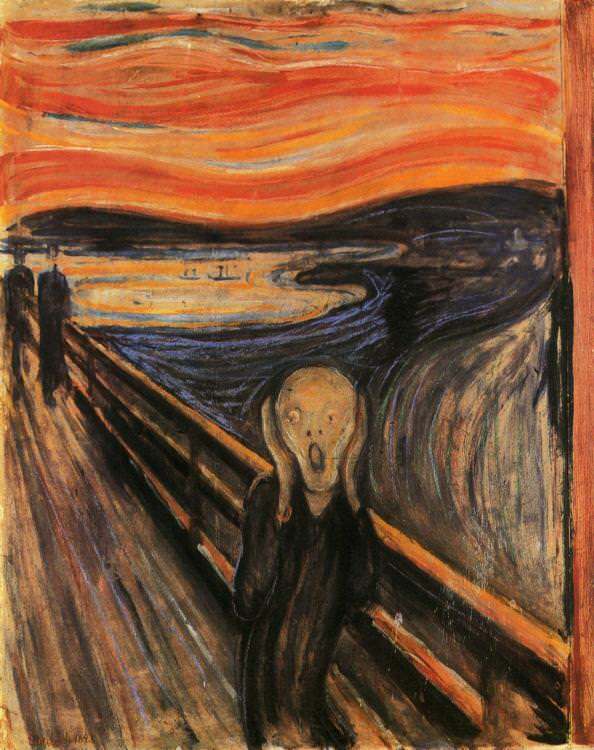 The Scream – that terrifying image was my own living nightmare, every single minute of every single day. My "tinnitus odyssey" – that is what I call it. I went on an odyssey, as do so many others who not only have tinnitus but who truly suffer from it. I started with an ENT friend of mine – then another – then an otologist – then another. I saw my internist. I saw a neurologist. Audiograms, imittance testing, MRIs. No improvement. No answers. Try this. Try that. No relief from the thunderous noise that was omnipresent. One ENT (meaning well, I am sure) hammered the first nail into my coffin of sorrow when he uttered the incantation familiar to most everybody with severe intrusive tinnitus: "There is nothing that can be done for you; you will just have to learn to live with it." Those words are, of course, untrue. Those words are reprehensible. Those words are morally unacceptable. Those words are poison. Those words can take a treatable auditory phenomenon and turn it into a lifetime burden. Tinnitus patients should not be so sentenced ... tinnitus patients need not be so condemned. Please note that I refer to the concept of tinnitus being "treatable," even though it might not be "curable." There are many things that can be done to bring considerable relief to a tinnitus patient's great satisfaction – even in the absence of an absolute cure. To shut that door with a "nothing can be done" is predictably devastating to a person who shows up at a clinic because he or she is suffering, suffering in every sense of the word. I was indeed told that nothing could be done. And at the age of forty-five I broke down in tears in my wife's arms as I left the ENT's office that day. I refused to accept that I was facing a life of incessant screaming noise. So I went on. Three different specialists with extensive experience in hypnotherapy: no relief. I did, however, find myself getting increasingly depressed. Depression is not uncommon in severe intrusive tinnitus, which after all represents to the tinnitus sufferer a very significant loss – the loss of silence, the loss of peace and quiet, the loss of an entity so near and dear to us that we do not know how much until it is lost. The loss of silence was not my only loss. With my ears screaming to utter distraction, I lost my ability to function in the tense and demanding environment of the operating room. It did not happen all at once. I gradually began giving away the more challenging cancer cases and the emergencies. Eventually, the tinnitus and the depression feeding on each other, even the routine cases – breast biopsies, appendectomies, herniorrhaphies, and cholecystectomies – became impossible. Walking into the operating room with a freight train in my head and the gorilla of depression weighing on my shoulders was for me like Humphrey Bogart going back into the leech-laden swamp waters to pull his boat by rope with Katherine Hepburn aboard in the 1951 film classic, The African Queen. The burden became unbearable; I eventually had to stop operating and close my office. Moreover, because my health insurance was tied to my business, I lost that as well, and I became uninsurable. I spent most days lying in bed, rolling from side to side holding my ears in agony and trying to sleep to escape from my amorphous tormentor. On a "good ear day" I might be able to accompany my wife grocery shopping or drive my kids to school in car pool. My son, then four years of age, commented to me once that he wished he could reach into my ears with his little fingers and take out that bad sound so that I could smile again. How could this be happening? I thought I might be going insane. So I consulted a psychiatrist. I told him all about myself and said that I was hearing sounds in my head. He asked me to describe the sounds, so I did in great detail: the pitch, the loudness, the timbre, the character, what exacerbated it, and so forth. It took about twenty minutes, all the while the psychiatrist looking at me and listening intently. At the end of my tinnitus monologue, I asked him if I was crazy. And he then inquired, "Well what exactly is the sound saying to you?" Increasingly frustrated, I responded, "Haven't you been listening to me? I told you, it's a high pitched endless noise – like a cross between a teakettle and a jet turbine. It's not 'saying' anything!" At that point he looked into my eyes and said quietly, "Stephen, you are being tortured. You are miserable and justifiably depressed. But you aren't crazy. If it starts saying something to you, then you're crazy." I tried tinnitus maskers: no luck. Under the watchful eye of my doctors I tried anxiolytics and antidepressants. I tried electrostimulation and biofeedback. I left no stone unturned. I had read someplace that acupuncture could help. So I went to an oriental doctor who was a highly experienced acupuncture specialist. He told me that the reason my ears were ringing was that there was an imbalance between my liver and my kidneys, which he proposed to correct by sticking thin needles into my lower extremities. I know that may sound somewhat preposterous to the reader, but here is something even more preposterous: I actually believed him and underwent the treatment. How one's desperation and anguish can distort logic and basic common sense! I left the acupuncturist's office with many tiny holes in my feet – and with one larger hole in my wallet. My ears? They were screaming as loudly on my way out as they were on my way in. I joined the American Tinnitus Association with the idea that not only would I be kept up-to-date through reading their quarterly journal, Tinnitus Today, but also that I would be supporting educational programs, tinnitus advocacy, and tinnitus research. I must say that I do consider those dollars to have been very well spent. My odyssey went on, and yes, eventually I was indeed able to travel successfully along the path to meaningful lasting relief. The who, the why, and the how are much less important than the fact that it can be done. It most definitely can be done. No bird ever soared in a calm. Adversity is what lifts us. Dr. Nagler's Tinnitus Corner is provided for education and information only. It is not intended for the purpose of providing medical care and should in no way substitute for appropriate in-person consultations with qualified healthcare professionals. By using this site, participants agree to hold Dr. Nagler and Atlanta Tinnitus Consultants, LLC harmless with respect to any loss, injury, claim, liability, or damage arising from following the postings herein.